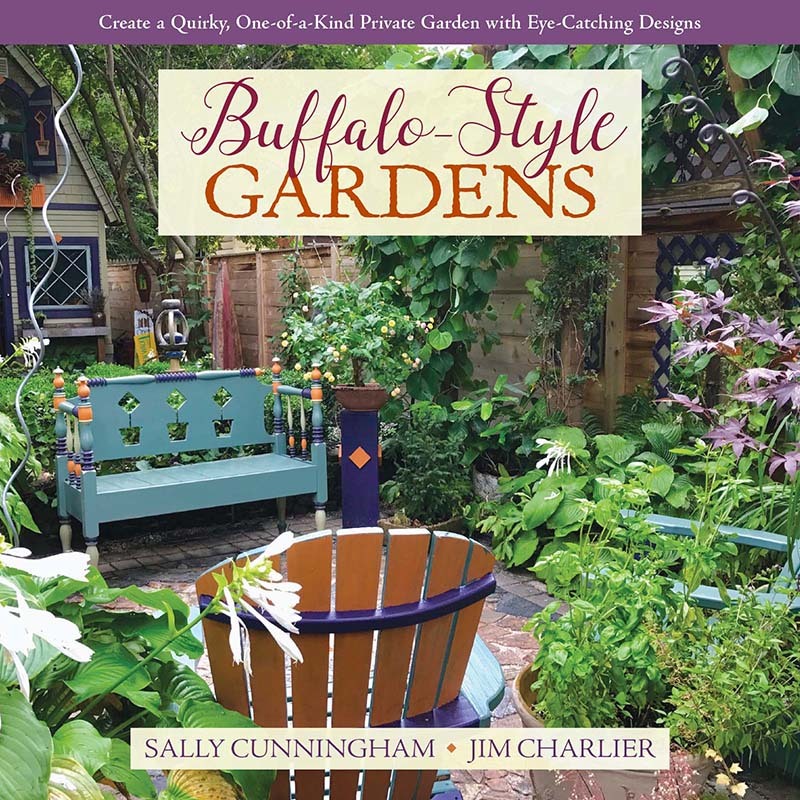 Sally Cunningham and Jim Charlier are Buffalo’s garden ambassadors. They are happy as a dogwood-in-bloom to share with you just some of Buffalo’s great gardens and gracious gardeners. The Buffalo News and Buffalo Spree Magazine columnist, past radio and TV garden personality, garden travel host with AAA, renown garden speaker, and author of Great Garden Companions: A Companion-Planting System for a Beautiful, Chemical Free Vegetable Garden steps out with her second book, Buffalo-style Gardens. After an early and intense career in government and commerce in New York, she left that world, returned to her Western New York roots and was happily reborn in the horticulture profession – where she’s thrived for nearly thirty years. Her first garden was 4,000 square feet of vegetables and flowers that buzzed with beneficial insects. She turned her attention to perennials, shrubs and trees. She focused on ornamental landscaping and became a CNLP (certified nursery and landscape professional) and began to help people design and care for their yards. But more than that, she was always teaching, whether on Sunday morning TV for twenty-three years, or in The Buffalo News and Buffalo Spree Magazine, which commit significant space to gardening and ecological content. Among professional honors, she was thrilled to receive Buffalo’s Ambassador of the Year award, and to be named Person/Professional of the Year by the New York State Nursery & Landscape Association, by PlantWNY, and by the Western New York Land Conservancy. In a logical progression, she was to lead some tours to those famous Buffalo gardens she talked so much about. With AAA of Western and Central New York she developed Great Garden Travel, to design trips and take people to see and learn about gardens even farther afield in the U.S. and Canada, and to Europe. You’ll see more of his photos and fewer of his words here. If you’re looking for Latin names, plant lists and hardiness zones, He’s not your guy (Sally’s your person!). If you’re looking for inspiration, ideas, and you’d like to see gardens you may never have seen or would like to visit, his photos are for you. He was fortunate enough to have married a flight attendant. They’ve traveled extensively and have photographed private and public gardens throughout the U.S., Canada, Mexico, the Caribbean, Europe, Israel, and more. Jim has written a garden blog, ArtofGardening.org, since 2006. It features Buffalo gardens, gardens he’s visited, and his own garden and DIY projects. Stop by for a visit! He came to Buffalo for college and never left. Not exactly a natural-born gardener (so he thought), he had a conversion experience as an early participant in Garden Walk Buffalo and went on to become president of the group (2006 to 2012) as it was growing to be America’s largest garden tour. He is also a co-founder of Gardens Buffalo Niagara (GBN), an umbrella organization that comprises about twenty garden walks, bus and bike tours, the Buffalo-style Garden Art Sale, and an Open Gardens program throughout summer months in Buffalo Niagara. About 1,000 gardens can be seen within a two-month period! Garden tourism is an unusual specialty that has partially motivated this book. Jim gives talks about garden tourism and consults with gardening organizations from around the U.S. and Canada to launch and promote their own garden tourism events. He has presented twice at the International Garden Tourism Network’s North American Conference, and in California for America in Bloom’s Annual Conference and Awards event. He spent my “formative years” working in advertising agencies, and has had his own advertising design/marketing business since 2000 (JCharlier Communication Design). His time in advertising has helped in the promotion of Buffalo’s gardens and outreach. He won’t stop until Buffalo is recognized nationally as one of the great gardening destinations. This book is part of that campaign. Buffalo-Style Gardens Create a Quirky, One-of-a-Kind Private Garden with Eye-Catching Designs was edited by Cathy Dees, designed by Holly Rosborough, and produced and distributed by Paul Kelly, all of St. Lynn’s Press, Pittsburgh, PA.
To view the St. Lynn’s Press collection of garden books, visit here.